The Tour of the Training Zones is one of the most important profiles in the ICA library. It’s a very educational profile that requires more talking than most profiles because there is a lot to explain to your class. But, what you teach your riders in this profile will trickle down to every class you teach after this point. 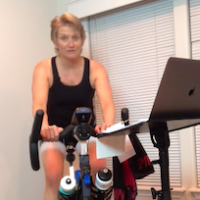 The intensity cues can be used over and over again in every other profile you create, helping your riders know exactly where you want them to be to receive the physiological benefits you’ve planned on for your training session. Because of the depth of information in this profile, I thought it would be helpful for me to do a video of me teaching this class. Watch the short video below where I explain what the hour-long Tour of the Training Zones video will teach you. You can find the full one-hour profile video here. While this profile is about power training zones, if you aren’t (yet) teaching with power, I assure you that you’ll still learn a lot—the intensity cues transfer to non-power instruction as well. You can read about the Tour of the Training Zones profile here. I’ve created a “Cliff Notes” version of the instructor cues with one large font page for each zone that you can download. Before watching the full hour-long video, make sure to download both the long-form profile—and review it first—and the Cliff Notes summary first so you can take notes. You can find both the download links below this video. The summary is in Word Doc form so you can modify it as much as you want—add cues or delete some, change songs, change the font, whatever. And please leave a comment if you found this helpful or if you have any other questions about teaching this extremely important educational ride. Oh, and if you have songs you have found that work well with this ride that you’d like to share, please leave them in the comments. Be sure to check out these articles on FTP training. You‘ve Got Your FTP Number…Now What? And to prepare your riders for the rigors of FTP testing, here is a 5-part series on teaching longer intervals. Is there somewhere we can get the Zone card you mentioned?